In a few weeks we will update our existing plans & pricing. Additional Amenities will be available for specific plans. Outsider, Migrant, Come n’Go Pass , & Resident pass updates. 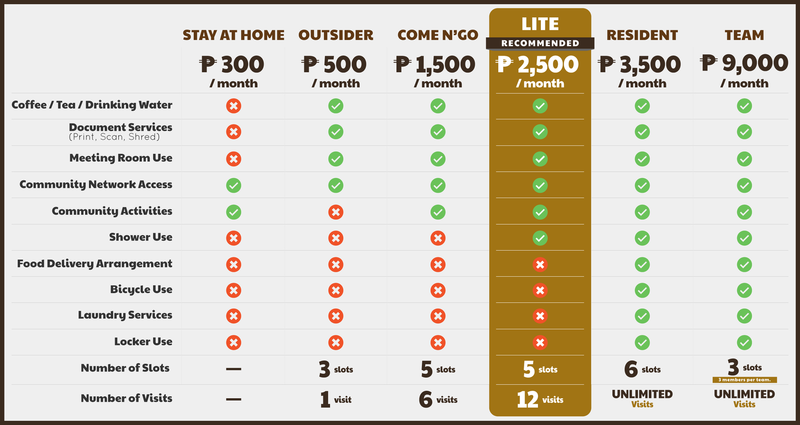 Introduction for Stay at home, and Lite plan. Members whose membership fee will be shouldered by their employers will be given priority among individual-paying members. The Stay at Home plan allows you to keep in touch with the community's inner network of coworkers. 1 month validity period. The Basic plan contains 1 membership entry, with a 1 month validity period. The new Come n'Go plan contains 6 membership passes, with a 1 month validity period. The Lite plan contains 12 membership passes, with a 1 month validity period. The Resident plan provides Unlimited Access to the space, with a 1 month validity period. The Team plan provides Unlimited Access to the space for a team of 3 people, with a 1 month validity period. We want to provide further value to our members so we are adding a few things for the community, and to the space. Lockers and Shower use will now be bundled with Full and Team plan memberships. Bicycles will be available for use of our members. Member-exclusive activities and events will also be introduced to the community. However, individual paying members will need to complete an online request form which will be subject for approval from management. This membership process is exclusive only to Full & Team plan members. Resident Plan holders need to renew their memberships to keep their current memberships. If you're one of our members whose membership will be affected by our new pricing, please send us a message at updates@agorscoworking.com for details about your membership. Members who have previously availed stacked membership plans are entitled to use the remaining stacks. However, upon renewal, the new rates will now apply. Thank you for all coworkers who have supported us through the first part of our journey. **Membership availability are still limited, and payment method is still via PayPal.